"Respect your elders." Lionsgate has debuted the teaser trailer for the full-length feature version of Uncle Drew, based on the Pepsi web series about the old timer basketball pro. NBA All-Star Kyrie Irving stars as Uncle Drew, with white hair and a white mustache, a masterful ball player who is recruited to return to the court and help a kid from Harlem win back his respect (and life savings). Lil Rel Howery also stars, with a totally rockin' cast including Shaquille O'Neal, Reggie Miller, Nate Robinson, Chris Webber, Erica Ash, Lisa Leslie, with Tiffany Haddish and Nick Kroll. 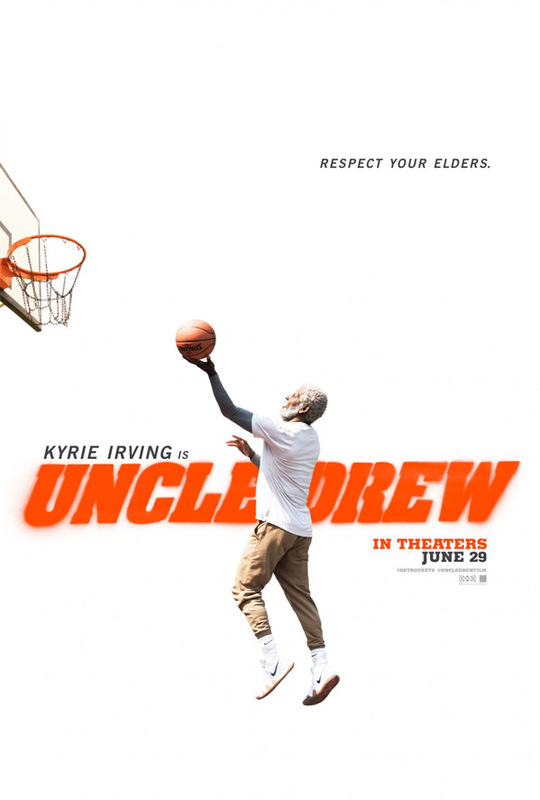 This basketball comedy concept, Uncle Drew, first started out as a "digital episodic series" made by Pepsi, that ran for five years, and is now being made into this movie. Most may remember the commercials that aired. Damn, does this movie look like fun. After draining his life savings to enter a team in the Rucker Classic street ball tournament in Harlem, Dax (Lil Rel Howery) is dealt a series of unfortunate setbacks, including losing his team to his longtime rival (Nick Kroll). Desperate to win the tournament and the cash prize, Dax stumbles upon the man, the myth, the legend Uncle Drew (NBA All-Star Kyrie Irving) and convinces him to return to the court one more time. The two men embark on a road trip to round up Drew's old basketball squad (Shaquille O'Neal, Chris Webber, Reggie Miller, Nate Robinson, and Lisa Leslie) and prove that a group of septuagenarians can still win the big one. Uncle Drew is directed by filmmaker Charles Stone III, of the films Drumline, Paid in Full, Mr 3000, Lila & Eve, and Step Sisters previously. The screenplay is by Jay Longino. Lionsgate will release Uncle Drew in theaters everywhere starting June 29th this summer. First impression? Who's in?